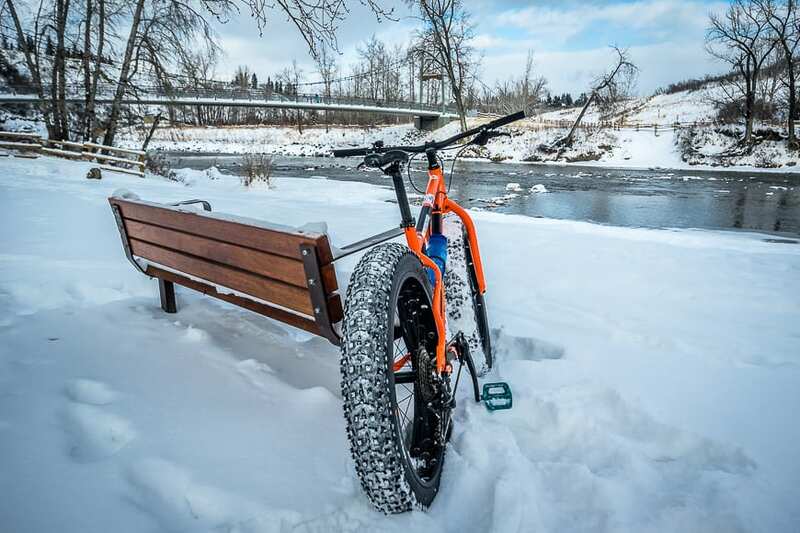 Fat biking in Calgary is an awesome way to see the city in winter. While the thought of bundling up and heading out in the cold may not sound appealing to many, it’s actually a lot of fun. The trails around Calgary are plowed after a snowfall as are the bike lanes so getting around the city in theory is easy. I say in theory because fat biking takes way more energy than regular biking. The tires are big – perhaps four inches across and they’re only inflated to 10 psi. So it’s a workout. And for that reason, even on the coldest of days, overheating is more of a problem than being cold. I made a spontaneous decision on the evening of December 23rd to reach out to Andrel Reid – the owner of Nomad Mobile Gear Rentals inquiring as to availability of fat bikes for Christmas Eve day. I figured I had the time, conditions were great and I wanted to try something I’d never done before in Calgary. Andrel promptly replied, said he had availability and showed up on my doorstep by 10 AM with two fat bikes. His business is renting – and delivering gear, whether it be fat bikes as in our case, road bikes, downhill and cross-country skis, snowshoes and the like. The beauty of his business model is that he both delivers and picks up from wherever it’s convenient to you. We took off from our house with the original intention of biking around Glenmore Reservoir – about a 24 kilometre loop. But we changed course when we decided to dispatch with some Christmas errands (way easier to do on a bike and no parking hassles) and from there elected to do a wonderful loop that took us through downtown, along the Bow River, up the Elbow River trail to Sandy Beach, then up a big hill to 50th Avenue SW, past our favourite coffee shop (Bell’s) off of 14th Street SW and home. All told we spent 3.5 hours between biking, errands and a coffee stop. It was an exceptional way to get exercise and spend Christmas Eve. Because we were on bikes and in exploring mode we stopped in amazement to look at the sheer number of Canada geese and mallard ducks in one of the lagoons at Prince’s Island Park. There had to be at least a 1,000 birds. And then we scored big time as a stop at the Sidewalk Citizen Cafe produced our favourite decadent sticky buns for Christmas breakfast. Riding a fat bike is also a great conversation starter. Almost everyone will stop and talk to you. Unlike puppies and babies, the best conversation starters I’ve come across, fat bikes aren’t cute but they’re still a novelty. John and I had chats with numerous strangers; we were given the thumbs up by drivers and repeatedly smiled upon. I’ve never experienced anything quite like it in Calgary. Go try fat biking. Rent a bike for a day, grab a map and have fun. That looks like so much fun Leigh, I never considered cycling around Calgary, always drove to the mountains (particularly the goat creek trail). That’s really good that they deliver the bikes to your home as well. Pretty decent service. @Marta Awesome service and a super fun way to spend a day in Calgary.